Sqadia.com V-Learning™ provide best medical video lectures for MBBS students and medical professionals. This ENT lecture at sqadia.com follows latest edition of “Diseases of Ear Nose and Throat” by PL Dhingra. Watch medical video lecture to learn about the congenital lesions of larynx such as subglottic haemangioma, laryngocele. 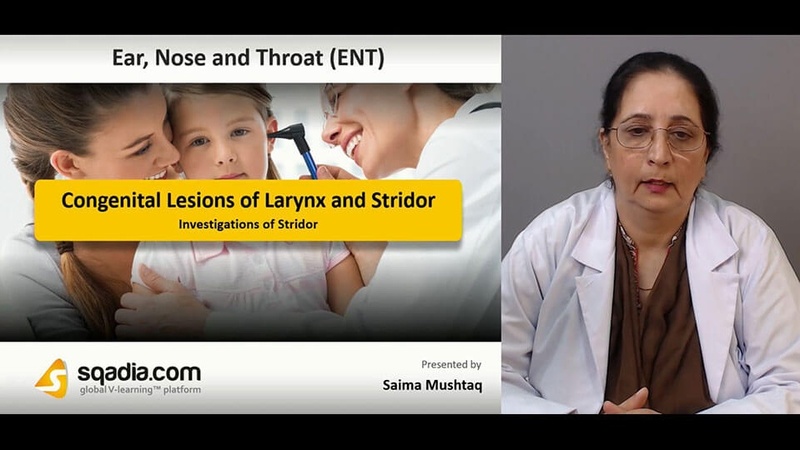 Aetiology, investigation and management of stridor is also discussed by Dr.Saima Mushtaq in detail. Clinical lecture of Otolaryngology at sqadia.com increase clinical information of medical students regarding congenital lesions of larynx. Congenital lesions of larynx involve several conditions such as Laryngomalacia, Laryngeal web, Subglottic haemangioma, Laryngocele, Laryngeal cyst. Laryngomalacia is characterized by excessive flaccidity of supraglottic larynx which is sucked in during inspiration producing stridor and sometimes cyanosis. Conservative treatment for Laryngomalacia involves Tracheostomy, Supraglottoplasty. Congenital Vocal Cord Paralysis Results from birth trauma and cause Anomalies of central nervous system. Congenital Subglottic Stenosis is due to abnormal thickening of cricoid cartilage or fibrous tissue seen below the vocal cords. Laryngeal Web is caused due to incomplete recanalization of larynx. Laryngeal Cyst arises in the aryepiglottic fold and appears as bluish, fluid-filled smooth swelling in the supraglottic larynx. 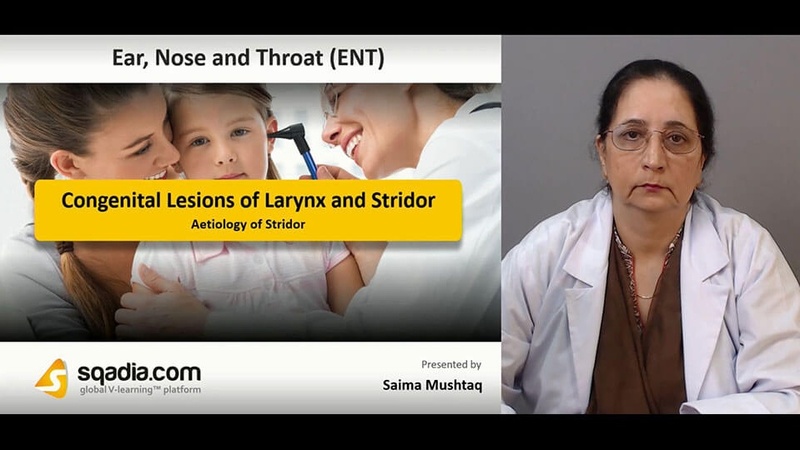 ENT lecture for medical students at sqadia.com explains aetiology of stridor in detail. Stridor is noisy respiration produced by turbulent airflow through the narrowed air passages. It may be heard during inspiration, expiration or both. Lesions of nose, tongue, mandible, pharynx, bronchi are some of the causes of stridor. Lesions of Trachea and Bronchi are congenital, inflammatory, neoplastic, traumatic. Inflammatory lesions cause Tracheobronchitis. Neoplastic lesions cause tumors of trachea. Traumatic lesions lead to stenosis trachea. Inflammatory Lesions Outside Respiratory Tract causes Retropharyngeal and retro-oesophageal abscess. Traumatic lesions outside respiratory tract causes FB oesophagus and Secondary tracheal compression. 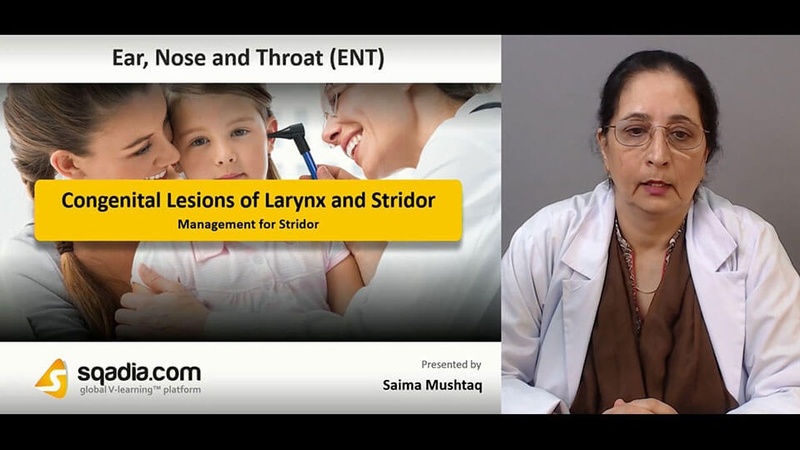 Management of stridor is elaborated in this section of ENT lecture for MBBS student at sqadia.com. Stridor is a physical sign and not a disease. It is important to elicit time of onset, mode of onset, duration, relation to feeding, cyanotic spells, laryngeal trauma Stridor is always associated with respiratory distress. There may be recession in suprasternal notch sternum, intercostal spaces and epigastrium during inspiratory efforts. Associated characters of stridor are snoring or snorting sound, gurgling sound and muffled voice, hoarse cry or voice, and expiratory wheeze. Flexible Fibreoptic Laryngoscopy can be Done under topical anaesthesia as an Outdoor procedure for Examination of nose, nasopharynx & larynx. 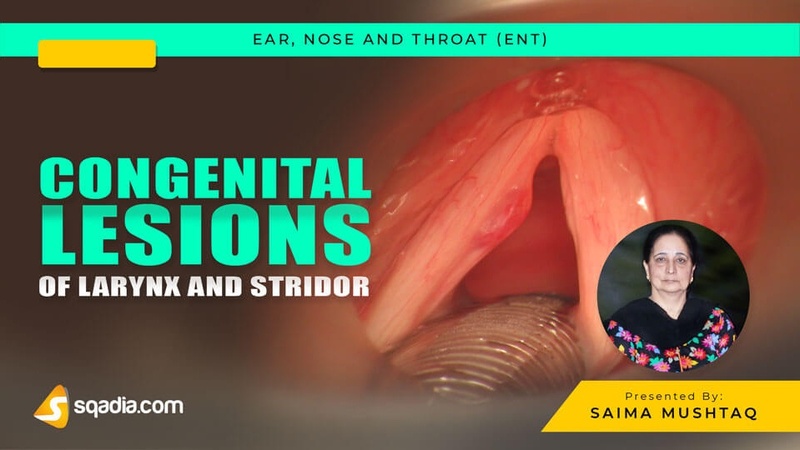 Medical video lecture of Congenital Lesions of Larynx and Stridor also make medical students enable to investigate stridor. For proper investigation of stridor, it is important to take history and careful examination of patient as these factors play an important role in dictating the type of tests required. Soft tissue lateral & PA view of neck and X-ray chest in PA & lateral view helps in diagnosis of foreign bodies. Fluoroscopy of chest Diagnose radiolucent foreign bodies. Oesophagogram is carried out For tracheobronchial fistula. Microlaryngoscopy and Bronchoscopy under general anaesthesia is done for monitoring oxygen saturation, pulse, blood pressure, and electrocardiography of the patient. Bronchoscopy after laryngoscopy examines air passage.